The map also opened up some truly interesting conversations about the relationship between geography and identity. Almost everybody who put a dot on the map openly pondered where to place themselves: “What if I’m ‘from’ more than one place—as in, I grew up in one state but live in another now?” we were asked more than once. Not only did this open up intriguing questions regarding the complexities of place-based identity, but it enabled us to engage in deeper exchanges about the shared, slippery natures of our own relationships with place and “home.” It allowed us to go beyond the question, “where are you from?” and to have more personal interactions about migration, regional identities, and even family histories. More than once, I found that my sharing about why I’d placed myself in Kentucky (even though I was born and raised in New Jersey, I wanted to claim my current state of residence because it seemed so underrepresented on the map!) opened a door to further conversations. One man spoke about having grown up in Tennessee (one state over), and we talked about Appalachia and about writing from home-places marginalized by regional stereotypes. Another woman, not seeing Long Island on the map, asked if she could add it in (“Of course!” was our reply); our ensuing conversation led us to speak at length about NYC and her work as a literary agent with a special interest in supporting the work of APIA novelists and memoirists. One person who’d grown up in Puerto Rico was surprised and delighted to find that we’d included it on the map. Still others who were from places that we hadn’t managed to fit on the map (Wales, England, Canada) wrote themselves in (in a box labeled “other” on the left), and each time that happened, it brought to mind echoes of critical discourse about the politics of cartography: when one makes a map, one necessarily designates places as “central” vs. “marginal”, “significant” vs. “not as significant” by their placement and inclusion or exclusion from the projection. In generating our map, we decided to include only the fifty states, Guam, and Puerto Rico for reasons of visibility (to “zoom out” any more would have meant that there wouldn’t have been room on some of the smaller states to stick dots). But who, indeed, has the right to determine whose homes are featured or marginalized, included and excluded? We, too, were guilty of some forms of marginalization. How people chose to identify in terms of their relationship to APIA lit also proved interesting to observe. While some chose their dot color without a moment’s hesitation, others deliberated painstakingly over the choice. “What does ‘APIA’ mean?” many people asked (so many, in fact, that I eventually added an asterisked note explaining the acronym). Still others seemed unsure of what “counted” as Asian American literature, or couldn’t immediately call to mind the names of Asian American writers whose work they’d read. 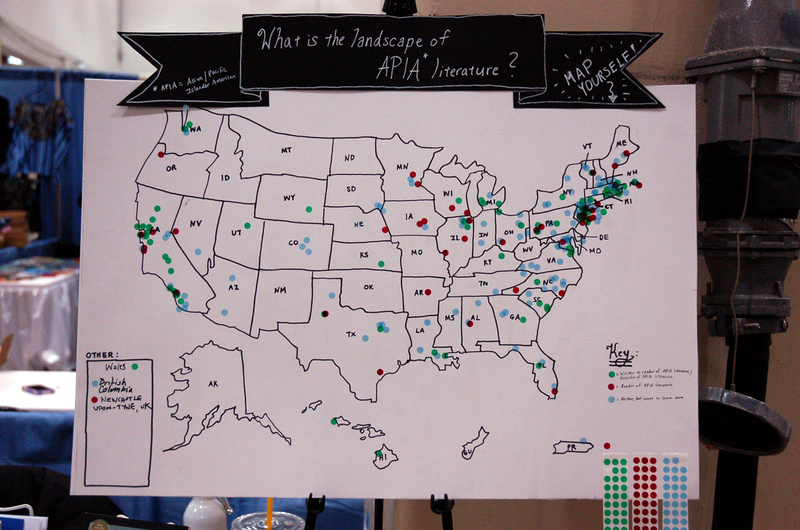 I had to convince a few people trying to decide between red and blue dots that they could still choose to identify as “readers” of APIA lit if they’d only read The Joy Luck Club (they may not have been regular readers, but they certainly counted as people who had read some APIA literature). I was encouraged to see many people identify as blue (“curious to learn more”), as it opened the door to many conversations in which we were able to recommend ways for them to encounter APIA lit for the first time. But I was also equally interested to see who self-identified as “green” (as a “reader and writer of APIA lit”). Most of the people who mapped themselves using green dots were visibly of APIA heritage, but there were also others who added themselves under that category, such as Vievee Francis, who, having published APIA writers in Callaloo, suggested that we add the alternative description “/publisher of” to the green dot category so as to encompass people like her, who felt deeply invested in the reading, writing, and promulgation of APIA lit despite not identifying as an APIA writer herself. Our conversations with Vievee and others reminded us of the shifting, slippery nature of the boundaries that society uses to delineate literary and racial categories alike—the very instability that we like to embrace and tease out and question here at LR, and which lies at the heart of our mission. “What is your state of origin?” he asked me several times, attempting to prove his point. “New Jersey,” I replied (truthfully) each time (though he was clearly fishing for a different answer). Our interaction with this man was an unpleasant reminder of the complications of being a person of color—and more specifically, a person of APIA heritage—in America. But it also caused me to think more broadly about the limited ability of a single physical or political map to communicate identity. True, we could’ve included Asia on our map had space permitted (in fact, we would have loved to include more countries, as many of our readers and several of our contributors are based in Asia, and we pride ourselves on interpreting “Asian American” quite broadly—both in terms of ethnicity and geographic locale). But even the most detailed, comprehensive map in the world would not have convinced this man of the “authenticity” of our having claimed the US as our homeplace; he had his own, fixed map in his head, onto which he’d placed us according to his preexisting notions about relationships between physical appearance and place. To be transnational or diasporic; to be from several or many, or even part, of a place or places, did not fit the logic of his internal notions of geography. (He did, at one point, inquire what we meant by “Asian American,” as, in his words, “Asia’s a big place,” but although he seemed to understand the inherently unwieldy pan-ethnic implications of the term, he could not seem to grasp the notion that American national identity could also fully inform the personal identities claimed by people of Asian descent). And so his own map had failed him. But in a way, so had ours, as all maps must do at a certain point. Maps can be beautiful and evocative and highly informative, but they are, at heart, only schematic representations, notational distillations of much more complex configurations and patterns of landscape and human behavior. I like that word, landscape, because it brings the notion of the “map” into the realm of the experiential, the real and 3-D, the shifting and unpredictable. People’s locations can be plotted on a map. But people themselves (and their stories) inhabit landscapes. A map is a tool that can facilitate the creation of a landscape, as the bare geographical details before us take flesh and rise up into larger, more robust, and infinitely more intimate narratives that color our worlds and help to contextualize our identities. May is APIA heritage month, and as we head into the thick of celebrating it here on the blog, I’ve been thinking again about the “landscape” of APIA literature (more specifically, APIA poetry) and how what we do here at LR is an attempt at a “mapping” of sorts. In striving to highlight the expanse and breadth of Asian American poetry, to push at and challenge its borders, and to help put Asian American poetry and poets on the literary “map,” we ride a fine line. How can we be both “of here” and “not of here,” a center for literary community-building, and yet global in both import and impact? We cannot be, or represent, all of what it means to be readers or writers of Asian American poetry, and yet, we must start somewhere, if we are to pave the way for greater exposure and deeper, more universal discourse about APIA literature. And so, we begin slowly, in the only way that we can: by adding more dots to our map—more people to the conversation—one at a time. Iris, this is fantastic. I love it. And I wonder how it will change if we were to do this again next year, when AWP will be in Seattle. More West Coast writers, a different landscape of APIA lit? Thanks, Christine. I wonder how the demographic might change next year, too. One of the people who stopped by our table this year actually suggested that we do the map again next year and compare it to this year’s; definitely something I’ve been thinking about!